"Typically hire equipment from your local DIY store will have a single vacuum and limited pressure which can lead to poor results, in the hands of the untrained this can lead to very wet carpets saturated with detergents that actually attract soiling making your carpeting dirty within a couple of months or worse a couple of weeks"
Above are pictures of our latest investment. 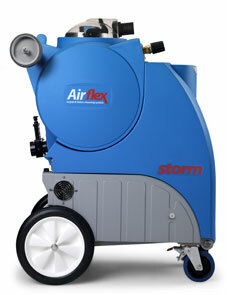 The acquisition of the new British designed and built AirFlex Storm portable extraction machine. I insist on the best and the AirFlex matches our high standards. Rather than use the standard available twin vacuum machines or tripple vacuum machines with 100 to 150 psi pumps or outdated machinery that has not much changed in decades, the AirFlex is at the cutting edge of technology. Up to 600psi of cleaning pressure and two of the latest high performance vacuums to extract the soiling and rinse your carpets and furnishings, leaving them fresher, cleaner and softer to the touch. With this powerful machine I can work at over 150 ft away allowing me to clean most properties and offices where access might be difficult. Our equipment is portable by choice. No need to leave doors open or have hoses trailing across your garden or driveway causing damage or hazard to neighbours, or a security risk to your office or property invalidating insurance, we can easily run from the van or securely in your premises. Our service is about choice. 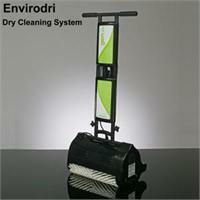 We also offer dry cleaning systems with our Envirodri process. Very suitable for the home and office for regular maintenance. Following a thorough vacuum we use advanced preperation sprays to loosen soiling followed by the application of dry powder microsponges. Agitation using the contra-rotating brush machine pictured right loosens soiling which is then absorbed by the powder. Once the granules are dry the carpeting is vaccumed again to remove the dried powder and encapsulated soil leaving the carpeting ready for use. This is just one of the low moisture systems we offer our customers and some other companies use just this one system but I think it's important my customers have the choice. My choice of advanced cleaning solutions from our selected suppliers includes those that will not harm the environment and are kind to your home, here is just a small selection from the range available. Our choices for you will not damage your wool or wool rich or blended carpeting and is fine on any synthetic.These latest cleaning solutions are available as standard to our customers we do not have hidden costs or 'extras'. Friendly to the environment, safe for you, your family and your pets. No harsh chemicals, no false scents, no optical enhancement. You can be sure it is a pure clean. I also offer a carpet restoration service. This is required when all else has failed you and it's either clean it or dispose of it. Public houses and restaurants suffer from oil, grease and alcohol tracked across the pile. This can harden to crust and end up looking like a tarmac road. We refer to this as black top. 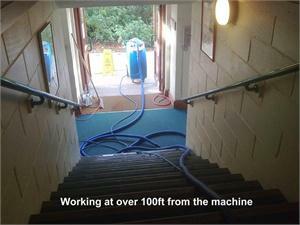 All is not lost, we have specialist cleaning agents that can deal with this situation but it is important than any restoration work is neutralised with our specialist rinse solutions.